I’ve noticed a trend in myself, something to be examined that makes me feel rather melancholy. I talk myself out of things that I really want to do. A class on coffee brewing at my favorite local coffee shop. The chance to listen to a Holocaust survivor speak about his experiences during WWII. I did this just last night as I stopped by the grocery store to get a bag of lettuce and passed by the beautiful display of Easter lilies. I love the intoxicating smell of those flowers, and the way they fill up the house with spring. Easter flowers and spring fragrance are beautiful. However, I walked right past, writing off the cost as a reason to not partake in the experience. I convince myself that it is ok to pass, that I do not need to attend or participate. Now, this isn’t a blaming exercise on people whose invitations take over my priorities. No, I freely choose to talk myself out of things that I want to do. There won’t be enough time to squeeze it all in; I won’t find parking; that activity, class, enrichment activity will cost too much money, or be frivolous, or not a good use of my time. At times, I can be a tentative, introverted decision maker that withdraws into myself rather than being brave and doing what I actually want to do. 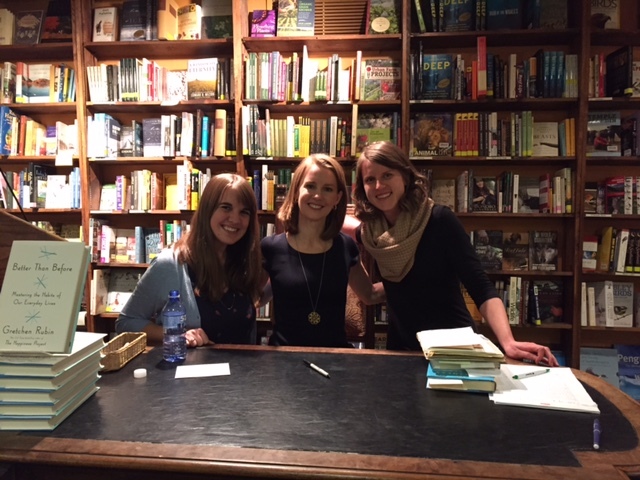 A few weeks ago, I received an email from the author Gretchen Rubin saying she was coming to a town near me. I immediately texted my mom and a friend and said, “Come with me!” It is harder to bail on things you want to do when you recruit other people who want to do that too. They agreed, we planned, it was a date. Even with a text-message commitment, I started second guessing myself. I just started a new job and they won’t like it if I leave work early, the cost of gas to get down to Denver is high, it will be a late night out. Wednesday morning I woke up to a rainy, cloudy day and my first thought was, “hmm, maybe it will rain and I won’t have to drive down to the bookstore tonight.” The day had just begun and I’d already started the talk to convince myself the experience wouldn’t be worth it. Up until it was time to go and pick up my mom I was second guessing myself. I pushed those doubts to the side and made the drive. We picked up my best friend from college. I drove through the city traffic at five pm gripping the wheel with white knuckles. With help, I successfully parallel parked for free! We went to a delicious restaurant near East Colfax called Pinche Taqueria (hey, I didn’t name it. I just ate there). 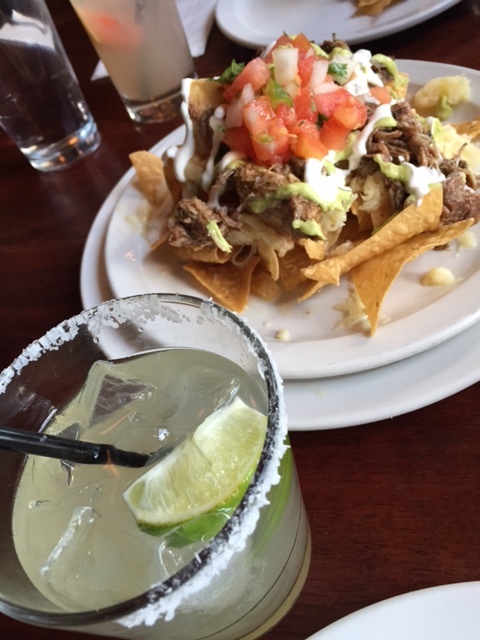 I ate tacos and drank a margarita, and enjoyed myself as the evening sunshine soaked through windows surrounded by rich, historic brick walls. My mom pointed at me and said, “aren’t you glad you made this a priority?” I wasn’t entirely sure yet. We still had meeting the author to go. After dinner, we walked across the street and opened the door to the bookstore. Ahhh, bookstores. The smells of paper and ink, the rich wood of the shelves filled with words of potential, life lessons, pain, and joy. Bookstores are beautiful things. One of the stipulations of getting a book signed was “buying your space in line.” I brought my own personal journal to try and avoid that financial cost, but upon arrival realized I may need to purchase a book to get my spot in the signing line. Very unlike myself, I charged through those doors, picked up a book off the shelf, and got in line at the cash register. “YOLO”, I said to my friend, “to hell with the cost. I’ve got to do this now.” Here I was again, convincing myself that my desires were worthy of investment. We walked down lush, carpeted stairs and found our seats towards the back of the room. I was so giddy when the author took the stage. Joy pulsed through my body, exhilarating my spirit, and putting a smile on my face. I did it! We made it! I’m here. Why don’t I allow myself to participate in these interests that I find intriguing on a more regular basis? Rather than continuing to beat myself up mentally, I sat down, listened, smiled, laughed, filled my heart with delight. After the reading, I got in line and got both my book and my journal signed. I felt very much like a kid at Disney World – remember how awkward it is to shyly present that autograph book to your favorite character? “Can you please sign my personal journal too?”, I asked, sheepishly, shy, and vulnerable. Gretchen smiled, looked at my collage book, and said , “Thank you for showing this to me.” Thank you, Gretchen, for having an interest in the lives of your readers. I have a memento from the night, proof and a reminder that it is beautiful to pursue personal interests. That life is meant to be enjoyed, rather than scrimped and saved and that there is beauty in being self-involved when it brings delight rather than fear or excuses. 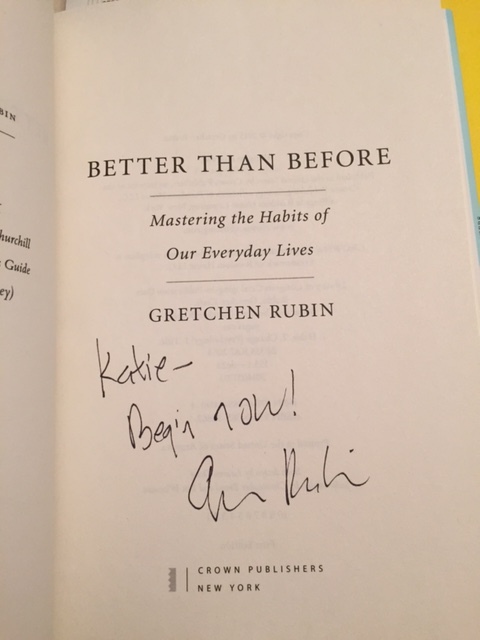 Gretchen signed my book, “Begin Now.” She was referring to habits, but those three words hold much power in their presence. Begin finding beauty. Begin erasing excuses. Begin doing what you want to do. What are you waiting to begin? No biscotti or nail polish this week. I was too busy eating tacos and accomplishing my dreams.